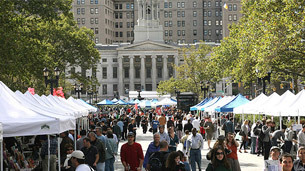 The ninth annual Brooklyn Book Festival will be on Sunday, September 21 from 10:00 a.m. to 6:00 p.m at Borough Hall and Columbus Park (immediately north of Borough Hall). There will be readings by and discussions with writers, readings and activities for children, and books for sale. There’s more information here. During the coming week and the Monday following the Festival there will be “Bookend” events held in various venues around the Borough. Among these venues are Book Court, Brooklyn Bridge Park, the Brooklyn Historical Society, DUMBO Sky, the Powerhouse Arena, Smack Mellon Gallery, St. Ann & the Holy Trinity Church, St. Ann’s School, and Vineapple. A full schedule is here.